Boasting a bed of bright green, roasted asparagus drizzled with luxurious hollandaise sauce and a single poached egg, just begs to be served at a special brunch, breakfast or anytime you want it is so delicious. Though there are several parts to this recipe, do not be put off, it is easy and follows a logical sequence which results in your finished dish. If you're not already confident in poaching eggs, practice will make perfect. Once you get the hang of gently sliding a freshly cracked egg into barely simmering water, it's as easy as can be - just like riding a bike. This dish makes a beautiful, colorful presentation and is oh-so-rich. In a small saucepan set over low heat, whisk 2 egg yolks into 2 tablespoons of the melted butter. Continue whisking the butter into the egg mixture, 2 teaspoons at a time, until all the butter is thoroughly incorporated into the sauce. Do not rush this process, the longer and more careful you are the better the resulting sauce. The sauce is ready when it is thick, smooth, and glossy. Whisk the lemon juice and salt into the hollandaise sauce, and then continue stirring it for 1 minute. Remove the sauce from the heat, place a cover over it, and then serve it over the roasted asparagus and poached eggs once it is done cooking. Preheat an oven to 425F. Line a large baking sheet with foil and arrange the asparagus in a single layer on the tray. Drizzle the olive oil over the asparagus, toss it gently, and then roast it in the preheated oven for 15 to 20 minutes, until it turns tender and lightly browned. Transfer the asparagus to a platter and cover with foil to keep warm while you poach the eggs. Fill a large pan with water and bring it to a full, rolling boil. Reduce the heat until the water is just simmering, very slowly. Crack 1 egg into a small, heatproof ramekin (custard cup). Hold the ramekin just above the surface of the water and tip it so the egg gently slides into the simmering water. Repeat this process with the remaining 3 eggs. Cook the eggs for approximately 3 minutes until the whites are fully set, but the yolks are still soft. Very carefully drain the eggs with a slotted spoon and set them atop a double layer of paper towels to drain for 30 seconds. Divide the asparagus between 4 plates. 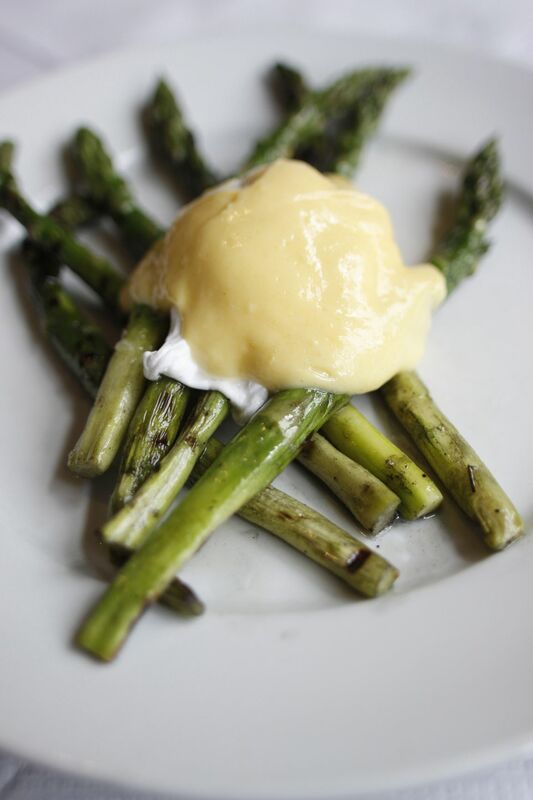 Sprinkle the roasted asparagus with the salt and pepper, pour a bit of fresh, hot hollandaise sauce over each serving, and then place a single poached egg over each serving. Serve the asparagus with poached eggs and hollandaise immediately.